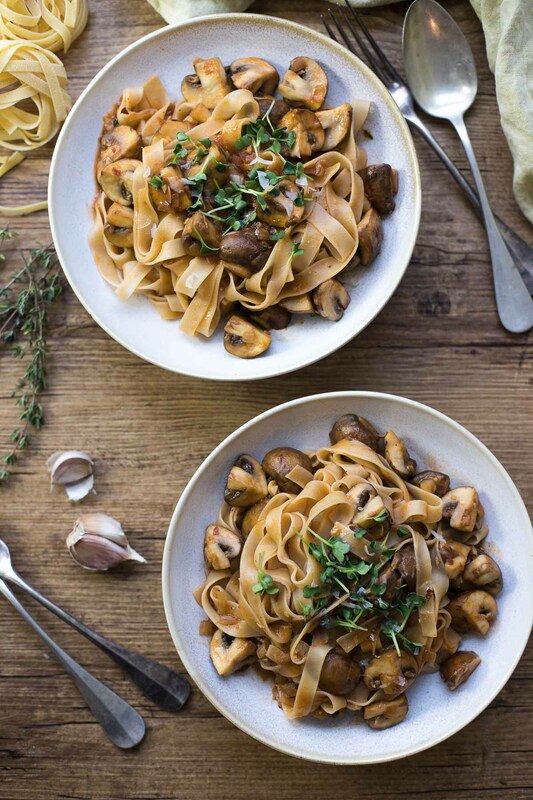 This is a spectacular way to showcase tasty cremini mushrooms – in a simple and delicious pasta with mushrooms and thyme sauce! This recipe shows you how easy it is to make a tasty pasta dish, the real Italian way, with just a few basic and fresh ingredients. The sauce it simple: there’s tomato paste, balsamic vinegar and dry white wine, which is flavored with sautéed shallots and garlic, some chili flakes and thyme. Sounds simple right? It is. Mushrooms bring a meaty, savory quality to the dish, along with tomato paste which gives it a boost of rich umami-ness, and thyme amps up the flavor. Of course, you could use every-day white button mushrooms for this but actually, they are the least flavorful of all the mushrooms. I usually reserve these for adding to salads. I recommend cremini mushrooms — the brown button mushrooms. You could also through in a few shiitake mushrooms since they are umami pur. Or if you can get your hands on them portobello mushrooms, which are simply delicious. Most important thing is to looks for mushrooms that are dry and firm, and have closed caps. Fresh mushrooms have a closed cap. A slightly opened cap doesn’t mean the mushroom is no longer usable, it just means it will have a stronger, more robust flavor. I prefer a more delicate flavor. And whatever you do, don’t clean mushrooms in water! They absorb water and the more water that is absorbed, the lower the flavor. We still want to hang on to that delicate flavor! 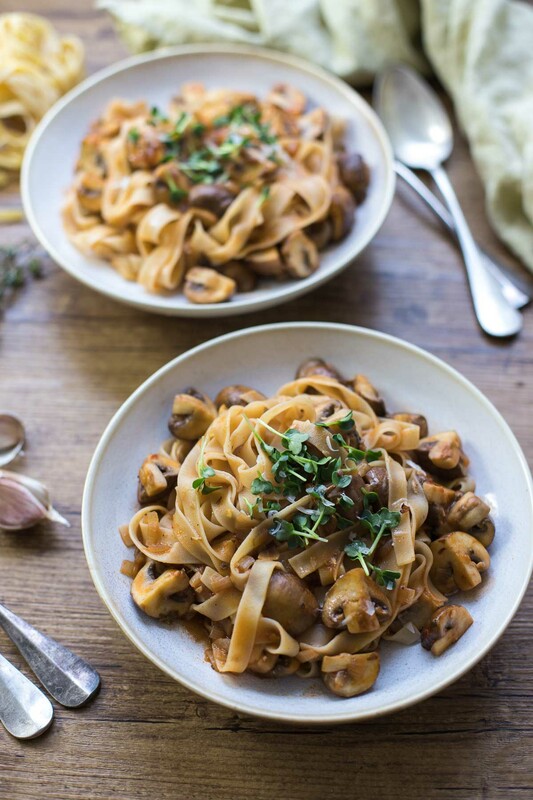 Pasta with mushrooms and thyme sauce – simple, fast, comfort food! So unless you are following a low-carb diet — which admittedly, as a late eater, I do this in the evening — this makes a terrific meal that is quick and easy to prepare. Perfect for midweek. But… it is pasta after all, which on its own has about 350 calories per 100 g serving. So if you are carb conscious, let’s say it’s best enjoyed for lunch. All in all, you only need 30 minutes to get this on the table, which is great when you are hungry…or “hangry”. A tasty way to use mushrooms in a meal. This quick and easy pasta recipe is perfect for vegetarians and adaptable for vegans. Combined with ribbons of pasta, it makes a very satisfying meal and one you can make on the fly. In a large deep skillet, heat the olive oil over medium to medium-high heat. Add the shallots and garlic, plus a pinch of salt and cook, stirring frequently, until the shallots are softened, but not browned (2-3 minutes). Add the mushrooms to the pan and cook until they get a little color (about 5 minutes), then stir and add 1/2 teaspoon sea salt. Continue cooking until the mushrooms become tender. Add the tomato paste, balsamic vinegar, thyme leaves and red chili flakes to the mushrooms. Cook for another 3 minutes, stirring constantly. Add the white wine and cook for a 2-3 more minutes, until reduced. Meanwhile, bring a large pot of salted water to a boil. Cook the pasta according to package instructions, until al dente, reserving 1/2 cup (125 ml) pasta water, before draining. Add a little of the pasta water to the mushroom mixture and stir over medium heat. Add the pasta to the pan and using tongs, toss gently to coat with the sauce, adding more of the pasta water, if needed. Taste and adjust seasoning, if desired. Garnish with grated parmesan cheese (if using) and serve immediately. The mushrooms make this dish quite filling, so unless you are a big eater, feel free to reduce the amount of pasta to 200g. Since mushrooms soak up water, so they should be brushed clean and not washed. I use a large deep non-stick skillet for this recipe. If using a heavy-bottomed skillet, the mushrooms will brown quicker, so best cooked on medium heat. Make it vegan: Use a vegan wine for the sauce (or replace it with 2 tablespoons margarine for extra richness), skip the parmesan and garnish it with micro greens or chopped parsley for some extra vitamins. 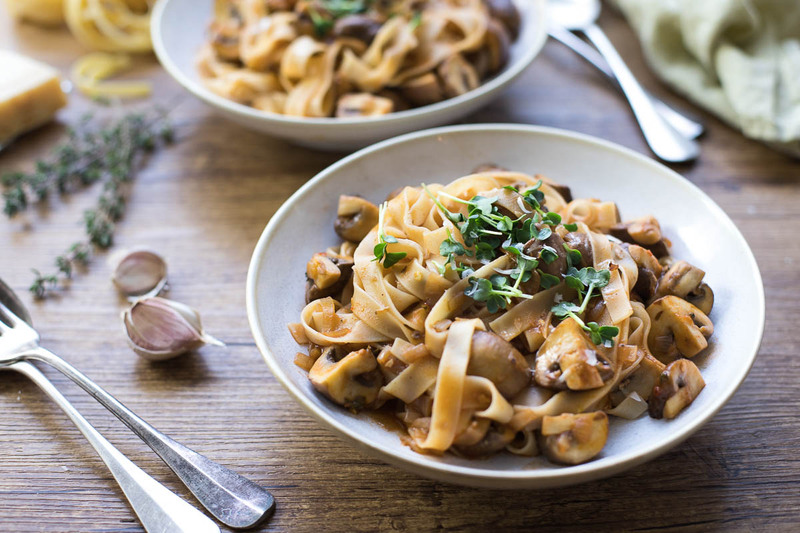 If you make this Tagliatelle Pasta with Mushrooms and Thyme Sauce recipe, I’d love to hear how it turned out for you! Be sure to rate it and leave a comment below to let me know! Especially if you have tips for other readers. Or take a picture and tag me on Instagram @ellerepublic and don’t forget to hashtag #ellerepublic so I don’t miss it!